We’ve already established the many reasons that your children will love our summer camp for kids. After all, where else can they enjoy nature while having fun with their friends and navigating obstacle courses? But why do parents like sending their kids to our kids summer camp? The Kids Are Excited to Go: Too many summer camps for kids are simply “a place for the kids to go.” Not so with Hot Ground Gym’s camp! We’ve created experiences so that the kids will be reluctant to leave at the end of the day and clamoring to come back the next (at which time they’ll be clamoring through the obstacle course!). Day camp shouldn’t be a place that kids endure; it should be a place that kids anticipate. Their Kids Are Exercising: We all know that kids across the country aren’t getting enough exercise. It’s not just an opinion, it’s documented fact. When kids are with us, they’re not sitting on the couch, playing on their iPad while snacking on chips. If we sit we might sit on the ground, which strengthens core muscles. Or we’ll take a knee, which improves balance. If we snack, it’s going to be something healthy. And, best of all, there are no couches and no wi-fi! You’d think kids would complain, but because we keep everything moving they never miss it. We’re ready to help your kids have a great, action-filled time this summer. 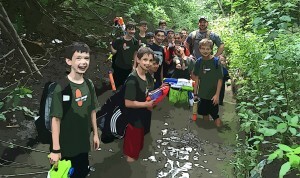 Download our day camp information and information packet right here.